After a delicious Holiday season, it's always nice to welcome the New Year with healthier versions of your favorite recipes! Hitting the reset button will help you to tackle 2019 head on, while feeling like your best self. One of our favorite things to do to feel a little bit healthier, without missing out on your go to recipes is a healthy food swap. Replacing something high in fat, carbs or sugar with something better for your body is a great step to a new you! 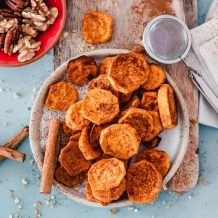 Today we're sharing our love for Sweet Potatoes and Six Fun Food Swaps to try this January. A hearty breakfast is a favorite of many people, but starting the day in a negative way can lead to bad consequences. Try upgrading your morning with these Two Ingredient Sweet Potato 'Pancakes' or check out this fun swap for your typical oatmeal, Sweet Potato Breakfast Bowls. Both options can be made savory or sweet, depending on what your family prefers! YUM! Sandwiches, dinners and many recipes can feel naked without a bun! Sure you could reach for a lettuce wrap, but a sweet potato is more fun + more delicious. What kids aren't a fan of Sloppy Joe's? Celebrate a total Mom win with these cheap and healthy Sloppy Joe Sweet Potatoes. Looking to spice up your January? These Buffalo Chicken Sweet Potatoes are all the fun and taste of buffalo sliders but with a healthy upgrade. In our house, Mexican is always a fam-fave. Ditch the unhealthiness and whip up these Southwest Stuffed Sweet Potatoes. The combination of citrus + savory + sweet will blow your taste buds away. Fajitas on repeat? Yes, Please! These Fajita Stuffed Sweet Potatoes will be your new go to. What's your favorite sweet potato recipe? Are there any fun, food swaps you're loving recently? If you try any of our recipes, be sure to tag us on social media!